As August marks Women’s Month here in South Africa, CHOSA wants to highlight the many amazing women that are a part of the work that we support in local Cape Town communities. This post will act as the first of many to share a little more about the strong women founders/directors/principals of some of our partner organisations that CHOSA works with. This weeks features Rethabile Sonibare, more commonly known as Ritsie, who is the founder and director of the Thope Foundation. The Thope Foundation is a leadership and mentorship programme for girls between grades 5-7. Along with this programme, the girls are also exposed to life skills, educational support, and robotics. Currently, Ritsie is working on launching the Molo Mhalaba School, which is set to be the first girls school in Khayelitsha. The school will begin as a creche (preschool) and grow with the girls throughout primary school, exposing them to focus areas within STEAM (science, technology, engineering, art and design, and mathematics). Ritsie’s role models are Oprah (for smashing ceilings), Beyonce (for owning herself), Chimamanda Adichie (for staying true to African feminism), and Thuli Madonsela (for bravery). Ritsie considers herself to be driven, not wanting other children to have the same struggles that she has had, she surrounds herself with people who have high ambitions and aspirations to provide a network of support around her pushing her to achieve all that she has set her mind to accomplishing, and more. Developing strong girls, through the leadership of confident women is the business of the Thope Foundation, and Ritsie encapsulates this work. Even on the harder days, she uses the girls in the Thope Foundation, and the girls who aren’t, as motivation to continue working hard to create opportunities for girls to be safe, educated, and inspired. Funding is the largest challenge Ritsie currently faces at Thope. Ritsie states that many funders want to know the end goals of a programme, while organisations are rather going for the long goal, making it challenging to find donors that align with Thope’s thinking. Thope’s main goal is to create educated and independent young women, who believe in their ability to create positive change in any field they decide to have a career in, yet this goal can only be measured years after Thope Foundation’s programme is complete in the lives of the girls. But, CHOSA has assisted Thope in this capacity. CHOSA provided Thope the first grant to help Thope establish their clubhouse, pay for a librian, and purchase some books for the library. 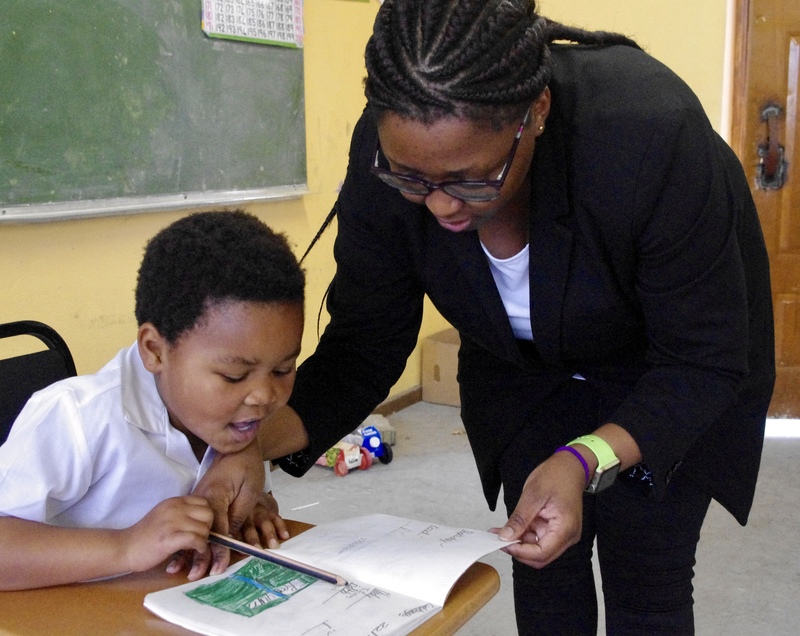 Due to CHOSA’s unique approach to funding development, CHOSA allowed Thope to think long term about their programme, and gave Thope complete control over how these funds would be spent to improve the lives and education of girls in Khayelitsha. In terms of the future of the Thope Foundation, Ritsie has a vision that they will pioneer the first true pan-African network of schools that serve children who otherwise would not ever be able to get high quality education in their communities. This is the legacy she wants Thope to leave, as she believes this is an incredibly important gap that currently needs to be filled in South Africa. CHOSA is very proud to have such strong women as Ritsie to be a part of the team of partners we work with on a daily basis. Thanks for showing to the world what girl-power truly means! Be on the look out for next weeks featured woman working with CHOSA!